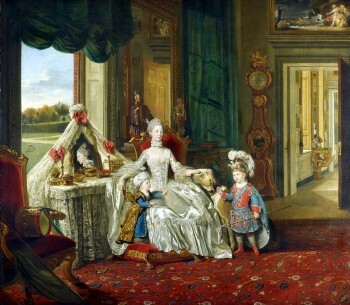 Chinese nodding-head figures are documented in England and Continental Europe as early as the 1760's and 1770's and Johann Zoffany's famous portrait depicting Queen Charlotte in her Dressing Room at Buckingham Palace painted in 1765 shows two such figures in the background (see C. Saumarez Smith, Eighteenth Century Decoration, New York, 1993, p. 255, fig. 246). Nodding-head figures were imported into England, Europe and America from Canton in large numbers from the 1780's. The great interest in these figures in England is derived in large part from the personal tastes of the Prince of Wales (later George IV) during the late 18th and early 19th Centuries. The Prince's interest in Chinese decoration was first expressed in his Chinese Drawing Room at Carlton House; however his sudden inspiration to achieve an Oriental interior at Brighton Pavilion was prompted in 1802. The final achievement, an ornate palace of fantastical proportions and exotic furnishings, was due to the combined efforts of the Prince himself and his principal designers, John and Frederick Crace, over the next twenty-five years. A number of Chinese figures of this type were prominently displayed in the corridor of the Pavilion (see J. Morley, The Making of the Royal Pavilion, Brighton, Boston, 1984, pp. 169-176). 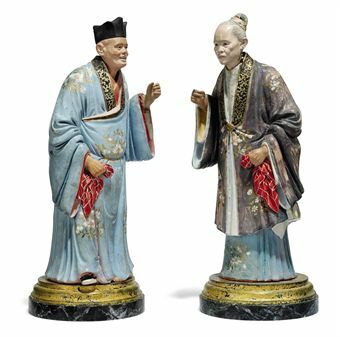 This Circa 1800 pair of painted-plaster nodding-head figures of a mandarin and his wife, each with outstretched hands and in floral and gilt-heightened robes, mounted on later parcel-gilt and simulated marble wood bases 15¾ in. (40 cm.) high overall sold for $35,925 at auction on May 20, 2010. 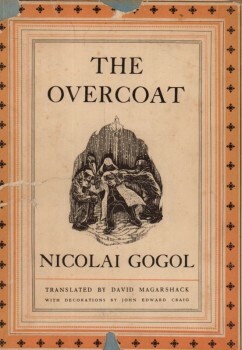 Writer Nikolai Gogol first referenced bobblehead dolls in 1842 in the Russian short story “The Overcoat.” He described the main character, Akaky, as having a neck, which was, “like the neck of plaster cats which wag their heads." Antique ceramic bobbleheads of animals were produced in Germany ranging in size from 6 to 8 inches. The first paper-mâché and ceramic generic and player specific bobbleheads were made. Roberto Clemente, Mickey Mantle, Roger Maris, and Willie Mays were the first non-mascot bobbleheads created. The uniforms were different but all shared the same face. Popularity was growing for bobbleheads in not just sports. 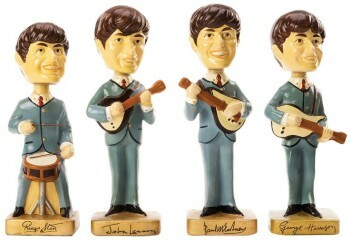 The Beatles bobblehead set was made and became one of the most famous and rarest of all time. It is still a valuable collectible today. Gold base baseball bobbleheads were issued. These were of inferior quality and would suffer from chips, cracks, and paint flaking. One specific player was made – Willie Mays. There was a lull in bobblehead collecting as collectors shifted to lunchboxes, action figures and video games. New manufacturing processes allowed bobbleheads to be made from plastic instead of ceramic, dramatically reducing the expense and difficulty of creating quality bobbleheads. Bobbleheads seemed to be 20th century relic by the turn of the century until a promotion by the San Francisco Giants brought the bobblehead back to the public eye. 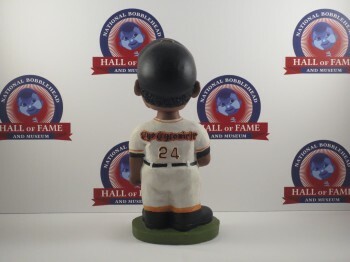 The Giants offered a Willie Mays bobblehead to the first 20,000 visitors on May 9th to celebrate the 40th anniversary of Candlestick Park, which was the last year of the Giants playing at that stadium. The promotion went very well, and more teams began to offer bobbleheads as a promotional item for their fans. New variations of the bobblehead were made including the mini-bobblehead, bobble computer sitters, bobblehead banks, and even bobblehead air fresheners. National Bobblehead Hall of Fame and Museum collection starts when Brad Novak, Co-Founder & President of the National Bobblehead Hall of Fame and Musuem, begins getting bobbleheads as a member of the Rockford RiverHawks’ staff. 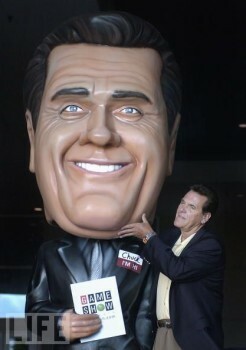 The Guinness Book of World Record for largest bobblehead was set for a bobblehead in the likeness of TV show host Chuck Woolery. The bobblehead weighed 900 pounds, was 11 feet tall and was originally displayed at the McCormick Place, Chicago, Illinois. A total of 334 bobbleheads have been given out as promotional items at major league ballparks. The Giants, the organization that resurrected the craze, have done the most promotions since 2010: 34 in that span, 77 total since 1999. 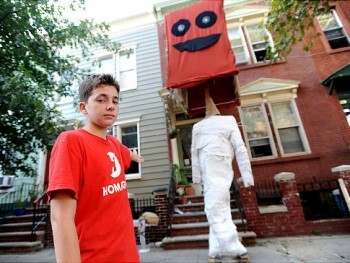 An unofficial world’s tallest bobblehead was made by 14 year-old Henry Ermer from Brooklyn, NY standing at 16 feet tall. The Marlins opened their ballpark with a Bobblehead Museum featuring 588 bobbleheads, representing every team in baseball. The display slightly vibrates so the bobbleheads are perpetually bobbing. 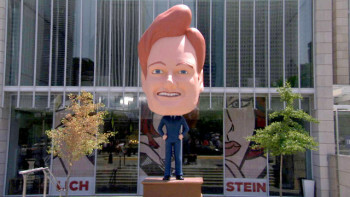 Conan O’Brien unveiled a 17-foot bobblehead of himself in Chicago. Personal collection of Brad Novak and Phil Sklar, Co-Founder & CEO of National Bobblehead Museum and Hall of Fame, expands to over 500 bobbleheads including bobbles from all sports and from across the U.S.
Phil and Brad develop a bobblehead of their friend, Michael Poll, a long-time manager for Milwaukee Panther athletic teams and Special Olympian. All proceeds from the sale of the bobbleheads benefit Special Olympics (www.michaelbobbles.com). 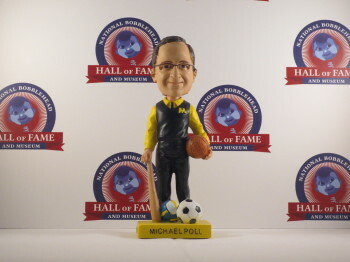 Phil and Brad, largely based on the amazing experience with the Michael Poll bobbleheads and the desire to pursue something they are passionate about, develop a concept for the National Bobblehead Hall of Fame and Museum. Recent University of Wisconsin-Milwaukee graduate, Jessica Listwan, creates the logo. 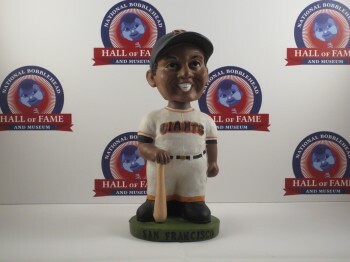 National Bobblehead Hall of Fame and Museum announced. National Bobblehead Day is established as an official National Observance Day to be celebrated annual each year on January 7th. This day is a celebration for all spring-connected head bobbing figurines. A 1961-62 New York Yankees Oversized (14") Promotional Nodder sold at auction by for $59,750. It was one of only two known in existence. According to John Brey of "The Nodder Exchange," this was "the most desirable nodder in the hobby, bar none." It's a truth that endures regardless of your personal team affiliation, and it's likely due to the fact that the Bronx Bombers claimed the World Championship during both potential years of production that the uniform was chosen. While five or fewer promotional nodders exist for each of the NFL teams of the era, only the Yankees model is believed to have been produced to represent our National Pastime. And today, just two of those are known to survive. 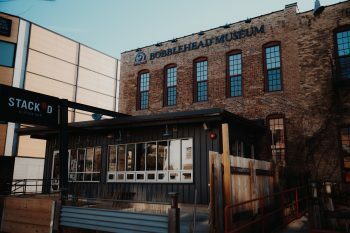 The National Bobblehead Hall of Fame and Museum opens to the public at 170 S. 1st St. in Milwaukee's Walker's Point neighborhood. 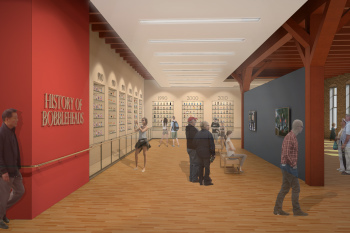 The Museum features over 6,500 unique bobbleheads, dozens of exhibits and a store featuring merchandise and over 500 bobbleheads available for purchase.